Every year during the Holiday season, there is a wonderful event that occurs at the Magic Kingdom in Walt Disney World. This special celebration is Mickey’s Very Merry Christmas Party, and is held on select nights beginning in late November through the latter part of December. What better way to enjoy the spirit of the Holidays than at this most magical place on earth. Join Mickey and all his Disney friends for a most excellent Christmas party, which includes an extravagant Holiday Parade, festive decorations, Holiday music, bright lights, magnificent stage shows, hot cocoa and cookies, a spectacular Fireworks display, and as an added treat, look up in the skies over Main Street, and you will see snow flurries. It’s a wondrous, magical Holiday Party that you will never forget! 1. Fees and Restrictions — Separate admission is required for this special event. The cost of the even tickets vary each year, and depend on the age of each guest, advance ticket purchase, day of event purchase, annual passholder rate, and Disney Vacation Club rate. The average cost is between $80 and $90 per guest. Tickets are non-refundable, even if there’s bad weather, so keep this in mind if the weather looks threatening. 2. Dates and Times — The dates also vary each year, but usually the Part is held on Sundays, Tuesdays, Thursdays, and Fridays. The special Holiday events begin at 7:00pm-12:00am, but with your even ticket, you can enter the Magic Kingdom as early as 4:00pm. 3. Fast Pass+ Reservations — If you enter the Magic Kingdom at 4pm with your Party ticket, you can make Fast Pass+ reservations ahead of time for the hours from 4pm-7pm. Fast Pass+ reservations are not available once the Party officially begins at 7pm. 4. Mickey’s Once Upon a Christmastime Parade — This amazing Holiday Parade is one of Disney’s most popular parades. It is filled with life size marching toy soldiers, dancing reindeer, jovial gingerbread men, Disney characters dressed in their finest festive outfits, and, of course, the jolliest Santa ever. It takes place nightly at 8:15pm and 10:30pm during the Very Merry Christmas Party. The second parade at 10:30pm is usually less crowded, so keep that in mind when you are planning your special evening. If you want to view the first parade, make sure you select your spot early. The best place to view the parade is on Main Street, where the Holiday theme comes alive with storefront decorations and fanciful window displays featuring moving scenes from a classic Disney film, Mickey’s Christmas Carol. While you’re waiting on the parade, enjoy complimentary hot cocoa and warm, yummy Christmas cookies, and to add to the spirit of the season, look closely and you will actually see snow coming from the skies over Main Street. 5. A Frozen Holiday Wish —Cinderella’s Castle Stage — There are two performances of this outstanding Holiday production (6:15pm, and 8:00pm), featuring Anna, Elsa, and their two friends, Kristoff and Olaf. This “Frozen” stage show highlights the story of Anna, Elsa, Kristoff, and Olaf, an their adventures in Arendelle. There is music, dancing, and a lot of laughter. The spectacular finale’ in which Elsa uses her extraordinary powers to transform Cinderella’s Castle into a shimmering Ice Palace for the Holidays is breath-taking. The best place to watch this exciting show is up front where you get a close and personal view of all the characters. However, if you want to really enjoy the transformation of Cinderella’s Castle into the Ice Palace, you might want to stand back a little further to get the whole effect of the change. From either vantage point, you will experience the magic of Disney at its best! 6. Mickey’s Most Merriest Celebration — Cinderella’s Castle Stage—New for 2016, this lively Holiday stage show will take place nightly during Mickey’s Christmas Party, several times each night. Mickey and his friends get together for a fanciful Christmas party, filled with music, dancing, and some special surprises. The show is performed on the Cinderella Castle Forecourt Stage. It is delightfully festive, with classic and contemporary Holiday medleys, and some special effects, like projection mapping on the Castle. In addition to classic Disney characters, Woody and Jessie from Toy Story, Peter Pan, Snow White and many other fan favorites will join the fabulous celebration. 7. A Totally Tomorrowland Christmas Show — This entertaining stage show takes place on Party nights in Tomorrowland at the Rockettower Plaza located between Space Mountain and the Carousel of Progress attractions. The star of this Holiday production is Mike Wazowski (Monsters, Inc.), who welcomes Buzz Lightyear (Toy Story) and Stitch (Lilo and Stitch) and other entertainers to the Party. Disney cast members don their Holiday costumes and sing and dance the night away, along with a lot of comical skits with all the Disney characters. Stitch is especially adorable and funny. This is a fun-filled Holiday show that will delight and amuse audiences with laughter, singing, and dancing. 10. Holiday Wishes Fireworks Extravaganza — This dazzling Holiday display thrilling fireworks, festive Holiday projections on Cinderella’s Castle, and the special Holiday musical accompaniment is truly one of the best Fireworks Spectacles in the world. Jiminy Cricket narrates this special Holiday performance, which is filled with festive music, color changing projections on the Castle, and the most sensational exhibition of pyrotechnic genius I have ever witnessed. The brilliance of the fireworks combined with the explosions that erupt with each musical climax is magnificent! Every night at 9:30pm during Mickey’s Very Merry Christmas Party, the Holiday Wishes Fireworks Extravaganza stops audiences in their tracks, and all eyes are on Cinderella’s Castle and the skies overhead. The lights go out, the music begins, the first fireworks go off, and the rest is “Disney Magic” at its best. This beautiful, Holiday production never fails to bring a tear to my eyes. It is filled with the spirit of the season, and the spirit of Walt Disney himself. If you are going to Walt Disney World during the Holiday Season, I would strongly advise you to make your plans to include this extremely popular Disney event. 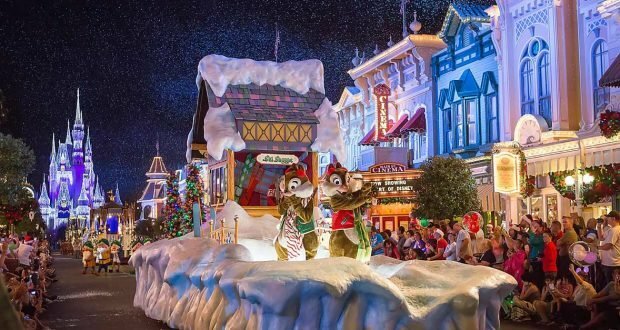 Mickey’s Very Merry Christmas Party is the hit of the Holidays at Walt Disney World and will give you and your family a special Christmas memory that will be cherished for years to come. It’s a wondrous, magical Christmas dream come true. I would also suggest that you purchase your tickets early, because they do sell out rather quickly.